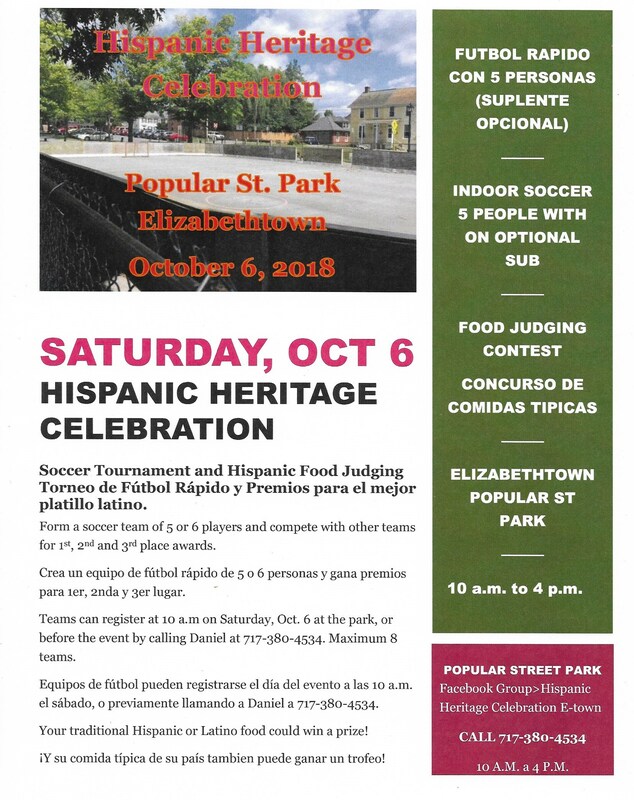 We’re excited about an activity this October 6, designed to bring Hispanics together around two favorite pastimes….soccer and eating! Of course, there will be music and Mexican Coke also! September 15 through October 15 is designated Hispanic Heritage Month in the U.S., and we want to celebrate it! We’re received municipal permission to use the walled in soccer field to organize a soccer tournament. At this point we have 4 teams semi-confirmed, and hope to have 8 teams by the day of the event. If you are interested in helping, please contact us! We’re excited already about the number of people who are interested in the event. We hope that this is the first of several such activities that will enable us to get to know the Hispanic community here, and perhaps the beginnings of a local Spanish language or bilingual Bible study or two. Popular Street Park, Elizabethtown, PA. 10 a.m. through 4 p.m. Trophies and medals for the winning team(s). Also awards for the best Hispanic or Latin food dishes.